What are you going to make from this sketch? Don't forget that any current products shown can be purchased on the online store. I used my June My Paper Pumpkin kit to make this super fun banner. Now I have something to hang outside my classes and parties so that everyone knows where we are! Besides the My Paper Pumpkin kit, I also used the Simply Created Build a Banner kit. This kit includes the canvas banners, twine, masks (to create the letters and patterns), everything you need to make a few great banners for your home and/or events! There are other banner kits, and accessory kits, available on the online store as well. 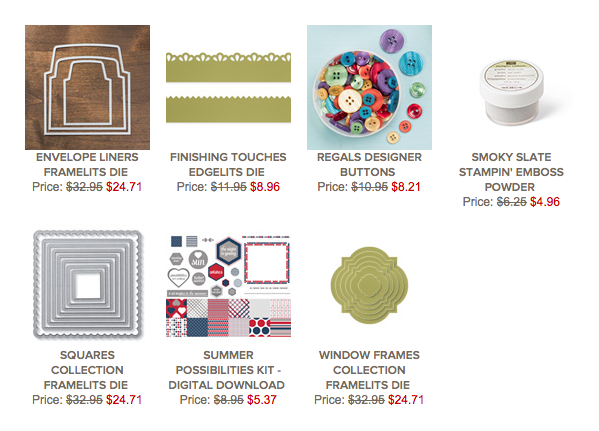 These deals and more are available on the online store! If you're placing an order, don't forget to use the hostess code "2HW7HMYM" for your chance to win a free 3 month subscription to My Paper Pumpkin (worth $75) and more! More information on that giveaway here. Are you a My Paper Pumpkin subscriber yet? If not, why not? 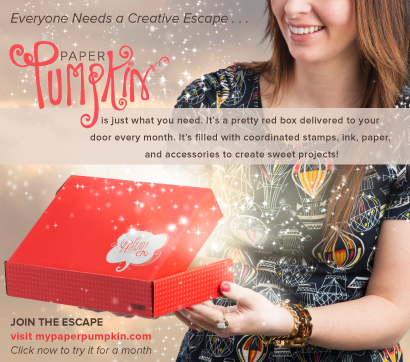 My Paper Pumpkin is the perfect crafting escape for, well, everyone! If you're a new crafter, you get a kit ready to go every month with everything you need to make a project you can be proud of. 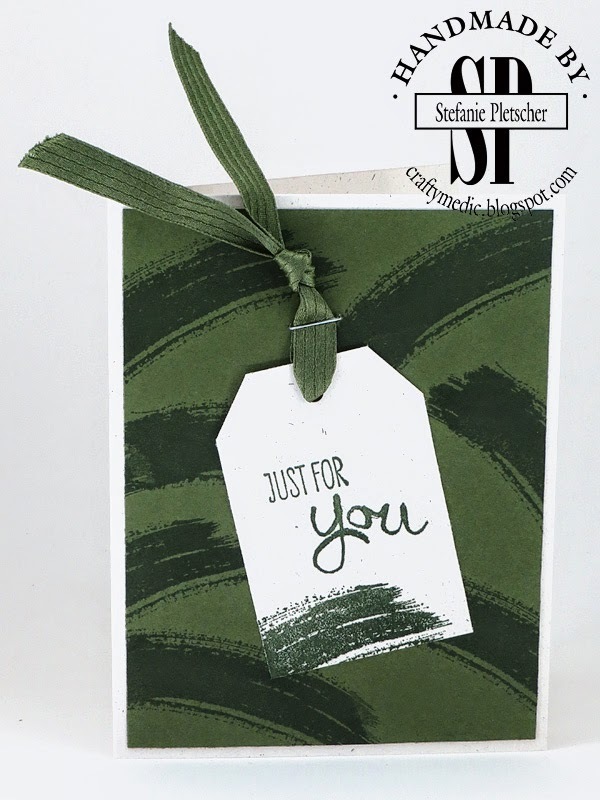 You get stamps, inks, paper, embellishments, and of course step by step instructions. 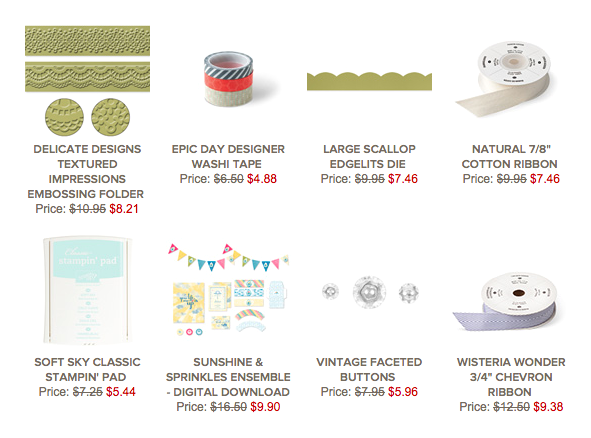 Cards, albums, decor items, every month is different and every month is special! 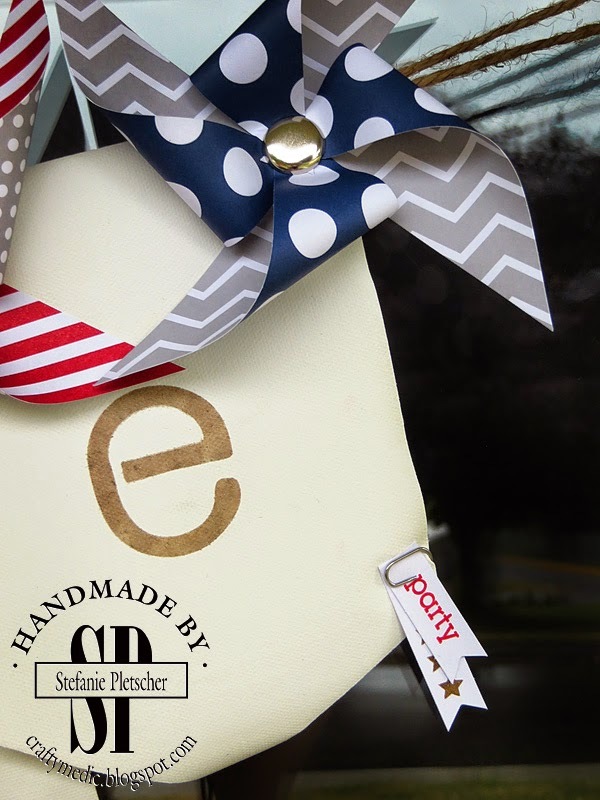 If you're already an experienced crafter, it provides you with a monthly influx of products and ideas that you can take and run with. Every kit includes instructions for the basic project, but the materials are so flexible you can add a few bits and bobs you have lying around to really make it your own! If you don't have room for a lot of craft supplies, you get a great stash of supplies that fits easily into a few DVD cases. Every kit comes in it's own box, smaller than a shoe box, and can easily be relocated. Every one of my subscribers will also get a case to hold their stamps. 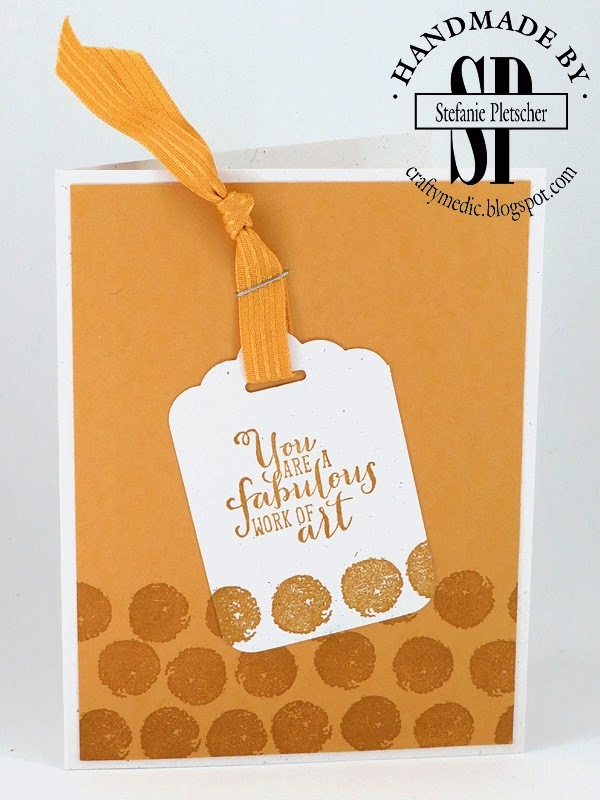 If you're a craft collector, every month you get a set of exclusive stamps you can use in any of your projects, as well as a handy mini ink pad you can't get anywhere else. The supplies and ideas you get every month also work well to start a fun stash of goodies without breaking the bank (or over running your house). Your monthly subscription is $24.95, or you can pre-pay for a 1, 3, 6, or 12 month subscription for yourself or as a gift (including a discount for 6 or 12 month subscriptions). This includes shipping directly to you, my monthly newsletter with ideas and inspiration, and for pre-paid subscriptions of 3 months or more, a free tape runner from me! You can also pause or cancel your subscription at any time if you need to. 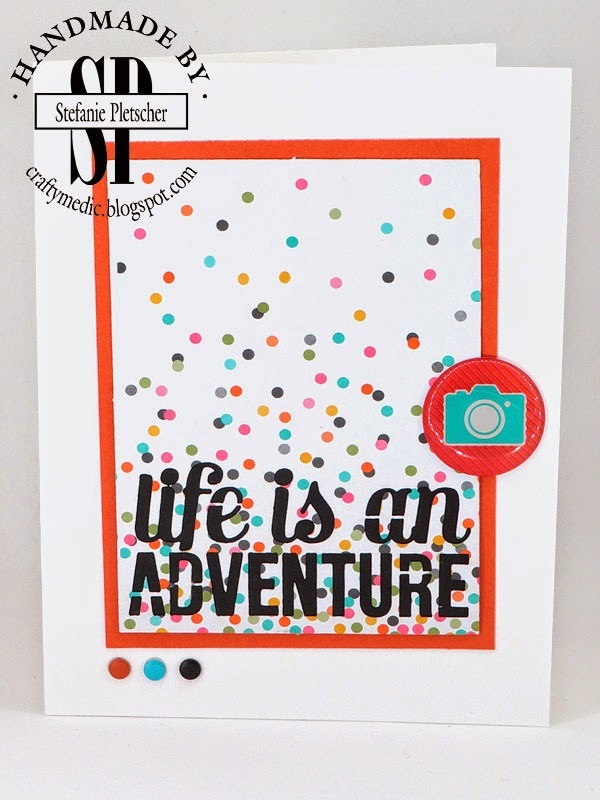 I'm going to be going to the Stampin' Up! Annual Convention in Salt Lake City, Utah from July 16-20th, so will be doing the draw when I get back. The major prize is the 3 month subscription, but I will also have other prizes that will be given away! You can click to order online, subscribe to My Paper Pumpkin, become a demonstrator, and contact me. OK, so I was out camping and totally missed this update this week. Oops! Crazy things happen when I don't have internet access. But we still have a few days to get these deals, so check them out on the online store! A friend of mine recently lost his furry little buddy, so I made a card for him to tell him I was thinking of him. 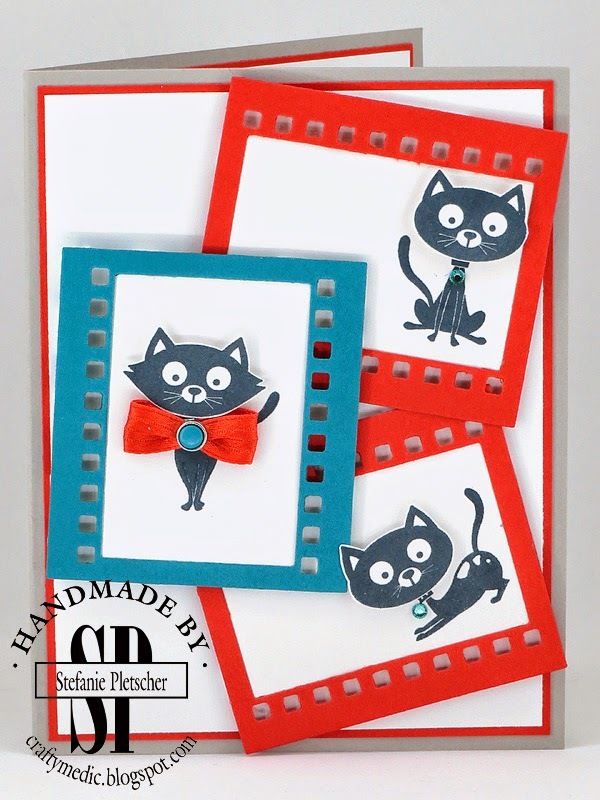 I used the adorable little cats from "You Little Furball" and the sentiment from "Hot Diggety Dog", along with some framelits and some embellishments. I coloured in the rhinestones with a Blendabilities marker. As always, all current products are available for purchase on my online store. I got my pile of new goodies the other day, so I had to play with some of the new ones. I saw a card similar to this on Pinterest somewhere, so I had to play with all my new star goodies. I made the shaker portion with window sheets and the new Star framelits, then filled it with sequins (star shaped of course) in the 2012-2014 In Colors. 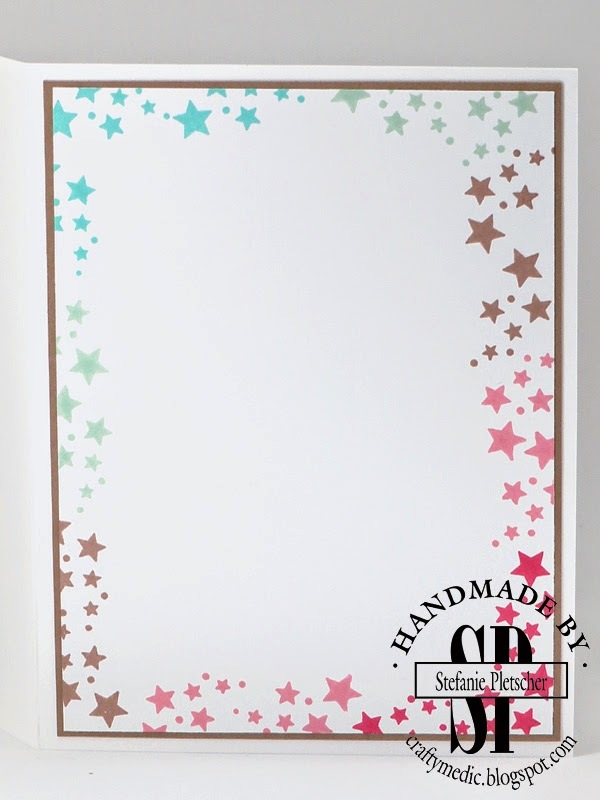 For the background I used the new stars mask to sponge the colours onto a piece of white card stock. A little stamping for the inside, and done! 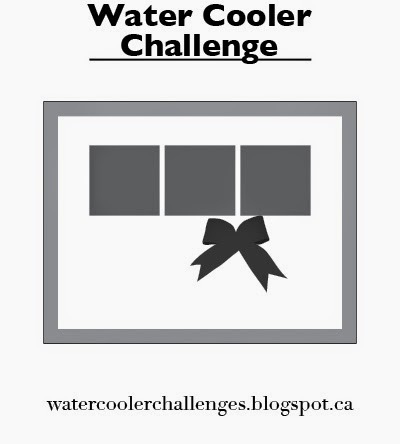 Another Watercooler Challenge for you! This time the challenge was to CASE (Copy And Share Everything) something from the new catalogue. I went pretty literal and made my own versions of the card on page 78. Here's my girl and boy takes! Head on over to the challenge blog to see other peoples' work, and submit your own! 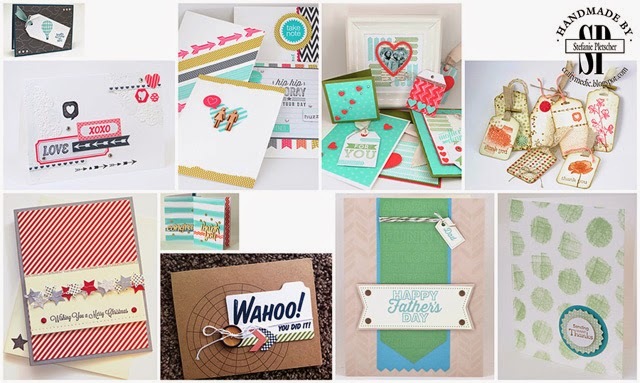 Another month another Wacky Watercooler Blog Hop! This month we're all featuring the new 2014-2015 Annual Catalogue, which I am totally in love with. If you're new to my blog you've probably come over from Heidi blog, and welcome! 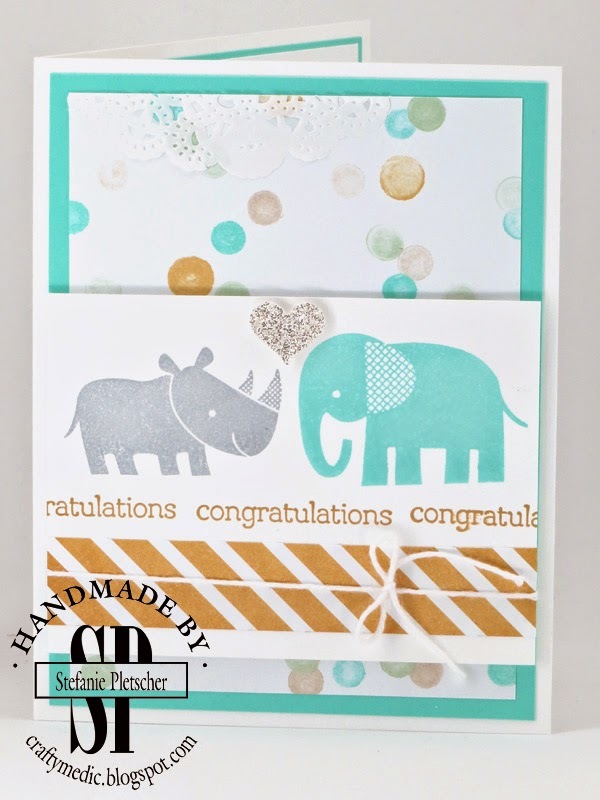 For those that are new to blog hops, you can go forward and backward using the water cooler buttons at the bottom of this post to check out the lovely ladies around the world that have put up posts featuring some old and some new Stampin' Up! products and projects. My project is one project with many many cards. 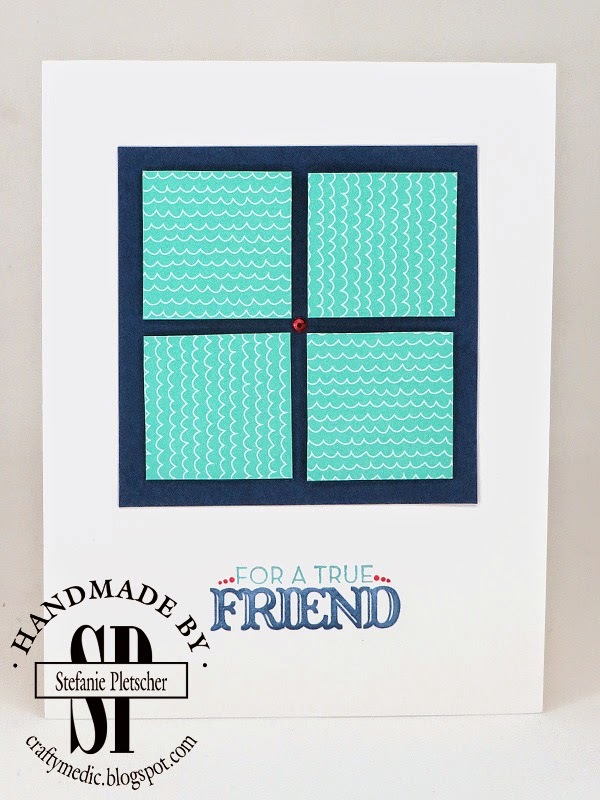 I've been making these "One Sheet Wonder" cards from a pattern of my own invention for a couple of years now and I always love how they turn out. 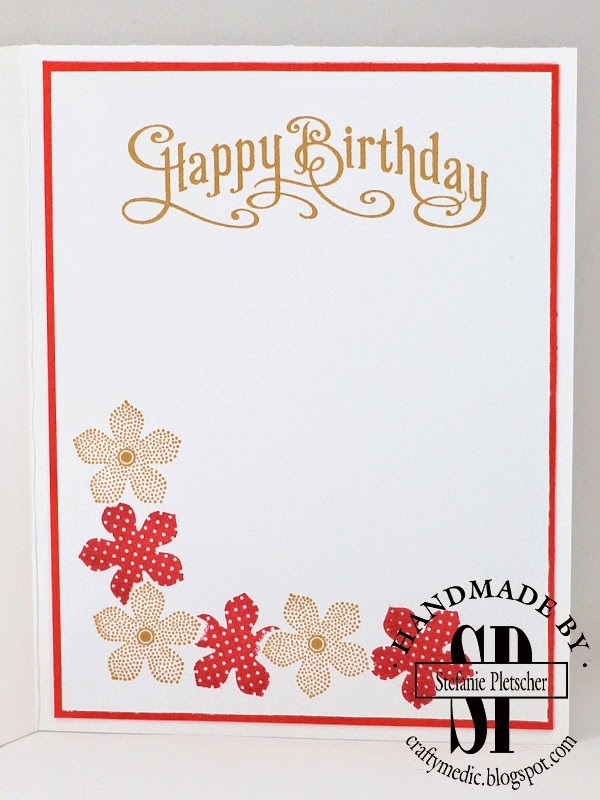 The basic premix is you take a sheet of 12x12 Designer Series Paper and cut it up into pieces to make 20 cards. 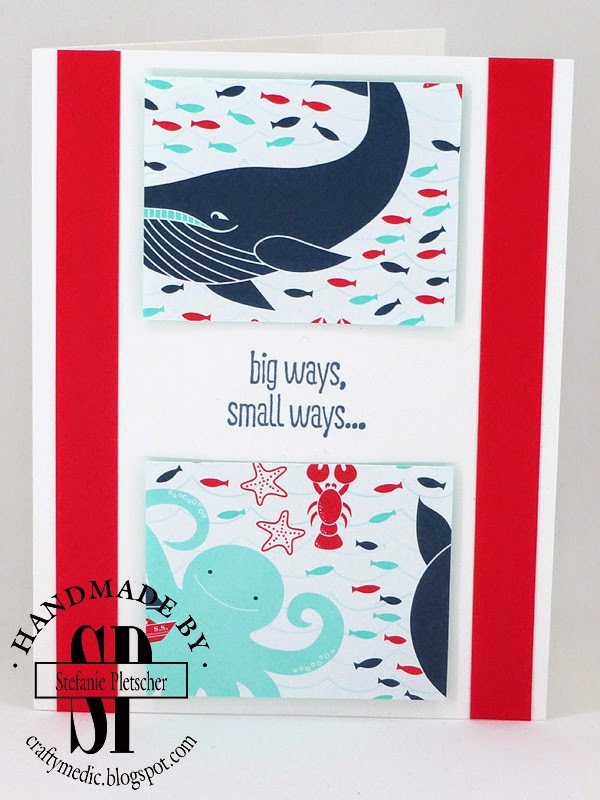 I will be sharing my pattern soon, so check back, but for now I just wanted to share some of the cards I made using the new Maritime DSP, Sea Street and Something to Say stamp sets. I embellished them with rhinestones (which I coloured with Blendabilities markers), Mini Brads, Candy Dot Brad Bases, Coastal Cabana thick bakers twine and regular white bakers twine. There's always a few scraps of paper sitting around on my desk, so I added those to give a little extra flair to some of my cards. Here's some of the cards I made, you'll have to come back to see the rest later! 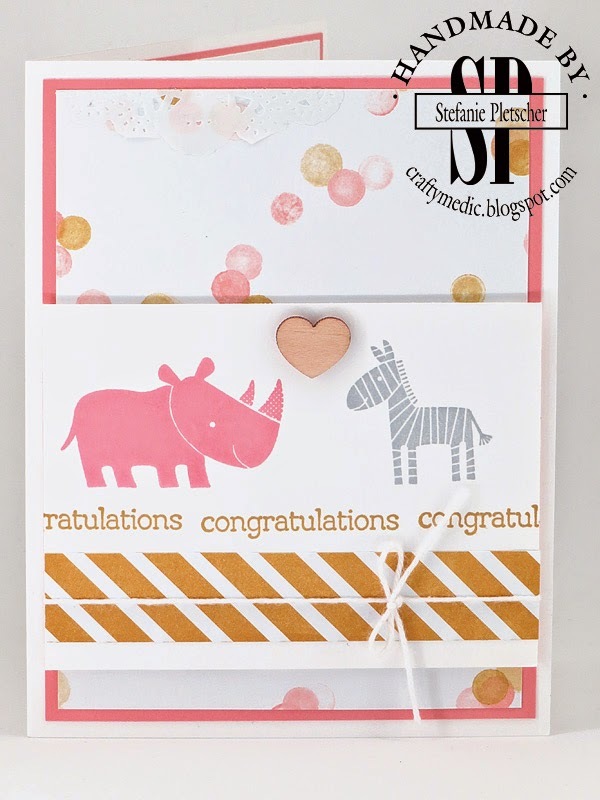 I couldn't have done this project without some of the biggest supporting players on my craft table, the Stampin' Trimmer (with rotary attachment and blades), the Simply Scored board and tool, Snail tape runner, and Stampin' Dimensionals. 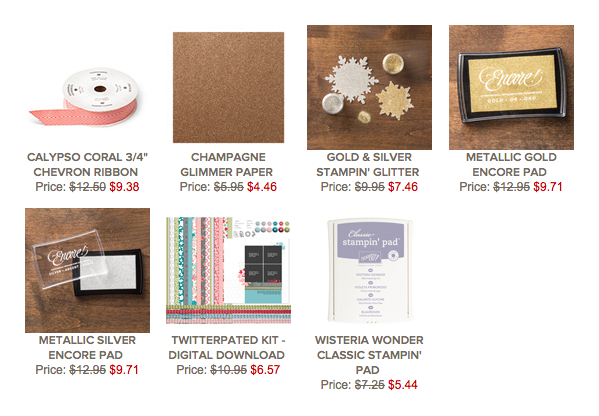 Any of the products mentioned in my blog today are available for purchase from any Stampin' Up! demonstrator. 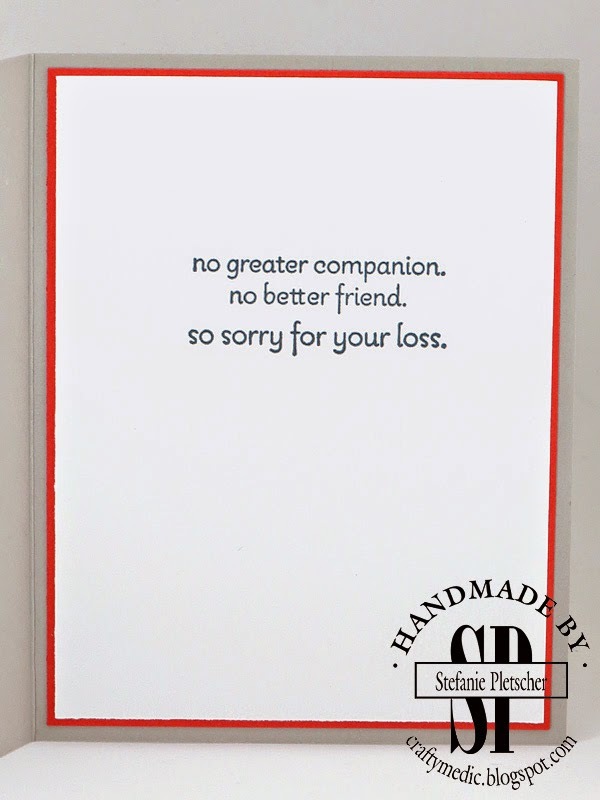 Feel free to come back to see more of the cards from this set and get the pattern. In the mean time, click forward and back to hop along the crafting trail to check out other peoples' projects! This week there's also a wonderful, very flexible (pardon the pun), new photopolymer stamp set available that I know is going to be the top of my next order. It's called "Calling All Heros" and is available on my online store like all current products. I'm not a scrapbooker. There I said it. I don't have the attention span to scrapbook, and while I used to be a photographer and definitely appreciate the memory keeping aspect of the hobby, it's just not my thing. But Project Life... So many adorable, amazing, lovely things. So I made some cards instead! 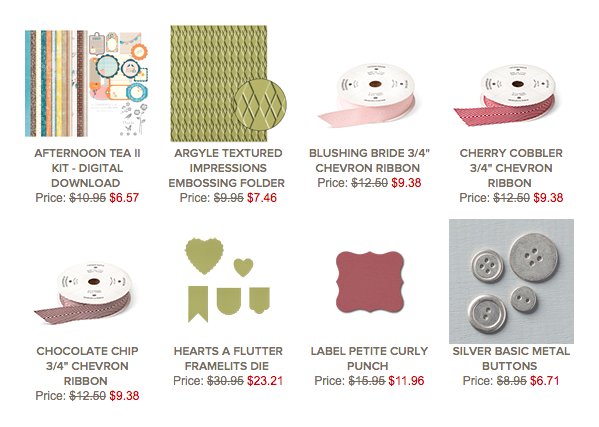 You can buy any of the current products I used here on my online store! 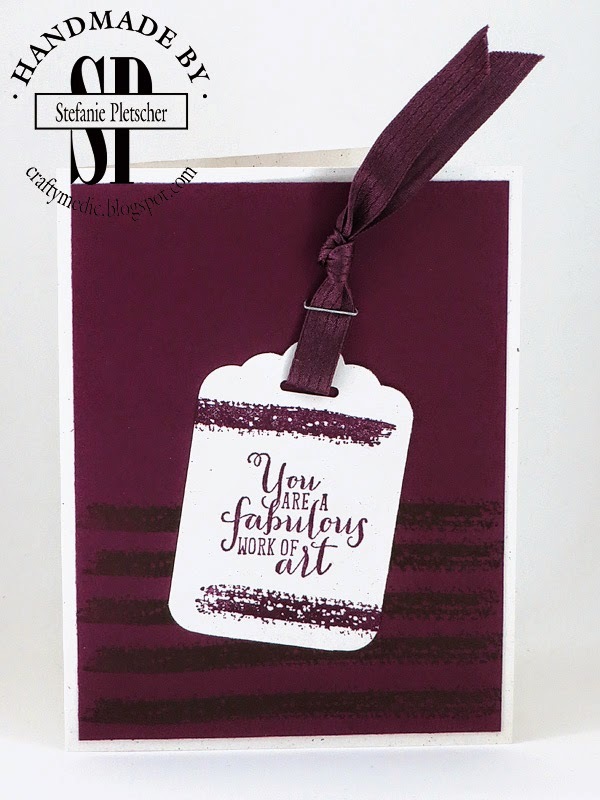 I promised you a look at all the cards from the In Colors I featured at the catalogue launch parties, and here they are! Each of the cards uses one of the new 2014-2016 In Colors (Blackberry Bliss, Mossy Meadow, Lost Lagoon, Tangelo Twist, and Hello Honey), as well as featuring some other new and continuing products. 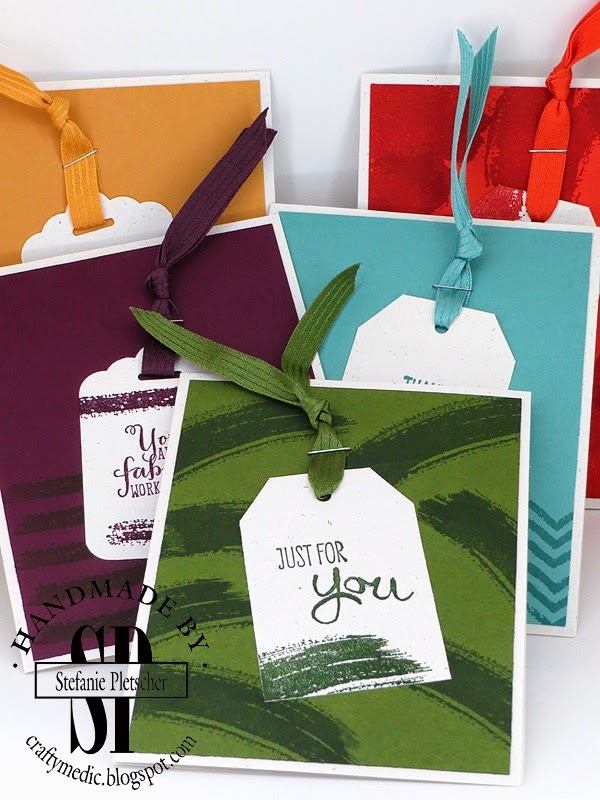 The tags are made with the tag topper punches, with the scalloped ones rounded with the Project Life corner rounder. 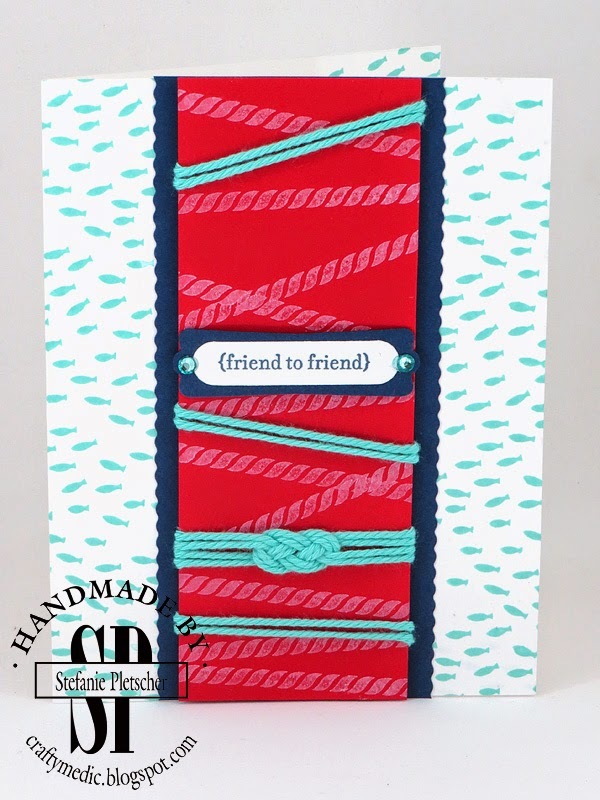 Matching ribbon tops each tag, while the stamping is done with the new "Work of Art" stamp set. All of the products used here are now available for purchase online. Order using the hostess code "BU6GBSJR" by tonight and you'll get a goodie bag from me and some free cards to make just like if you'd shown up to the launch party! In all the catalogue launch crazy, I forgot about Weekly Deals! Yes, these are still a thing, along with all the amazing new things and the clearance rack, so check out the online store! I delayed my post about the In Colors cards by a day too, but don't worry, it will be worth it. Today is the first party! If you haven't RSVP'd to come to one yet, make sure you put it in your plans if you can! 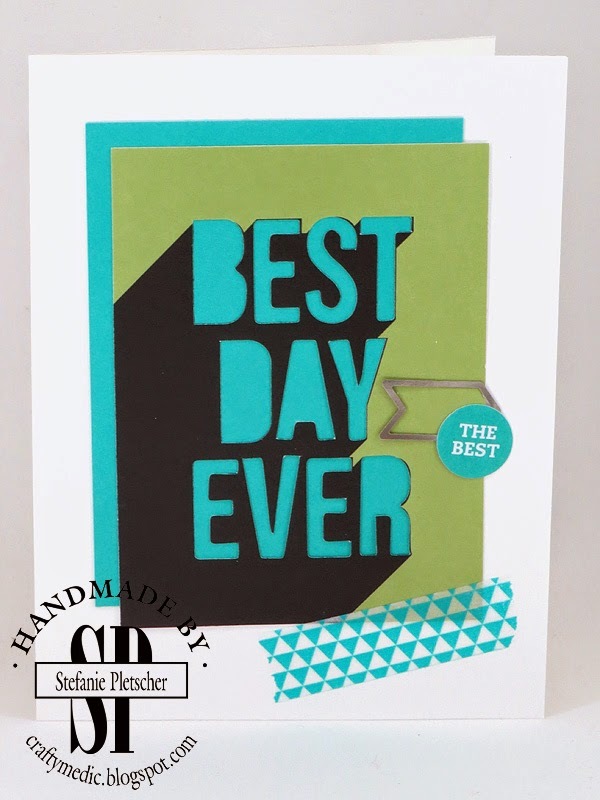 Everyone who attends either Campbell River event today, or the Nanaimo event tomorrow, will get a free goodie bag, a chance to make some awesome cards with some fantastic new product, and a chance to win some great prizes. You can also get a free catalogue for placing an order at the events. Here's a look at some of the cards we'll be making! I will share more photos and details on Wednesday. If you can't make an event, you can place an order online. Order using the hostess code "BU6GBSJR" and you'll get a goodie bag from me and some free cards to make just like if you'd shown up to the launch party! I'm so excited to be a part of yet another new venture! The Wacky Water Cooler crew has started a challenge as well as the usual blog hop! Every couple of weeks there will be a new challenge posted, with our projects and a spot for you to submit yours. This week the challenge was the new 2014-2016 In Colors, which I love so much it's not really a challenge! 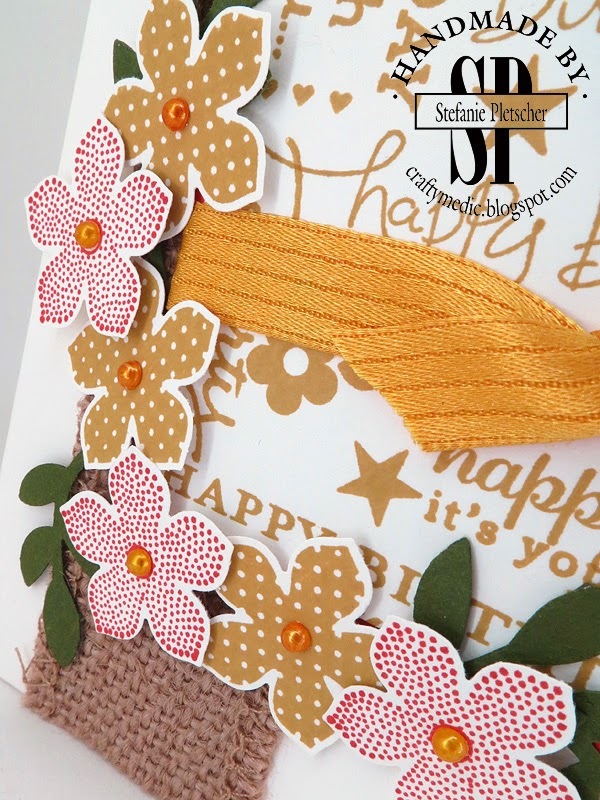 I chose to feature Hello Honey and Tangelo Twist in this bright and summery birthday card. I did use a little bit of Mossy Meadow as well for the leaves. 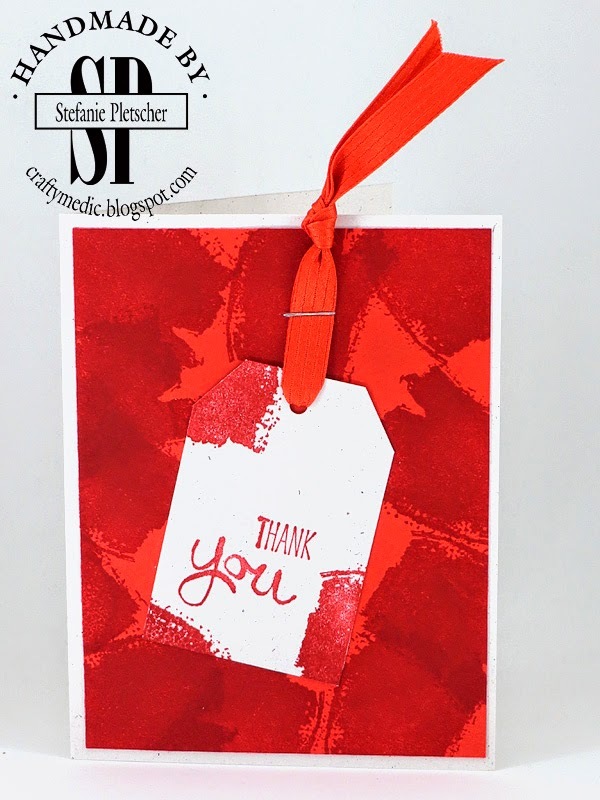 The stamps are new, current, and old, but the 'subway art' look can be made with pretty much any stamps. I like using the new photopolymer stamps to fill in any gaps left by the clear and wood mount stamps. Being able to see exactly where they'll stamp makes it a snap to fit them in between in the tight spaces. 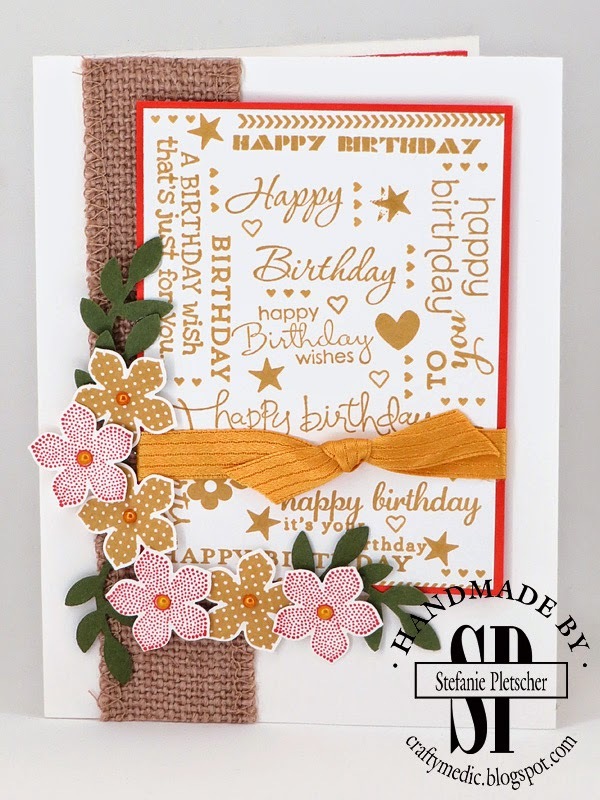 For the inside, I masked off the Hello Honey flowers when I stamped the Tangelo Twist ones so that they could over lap and give some layers without bulking up the card too much. I also used the new Blendabilities markers to colour some pearls to pop onto the flowers. 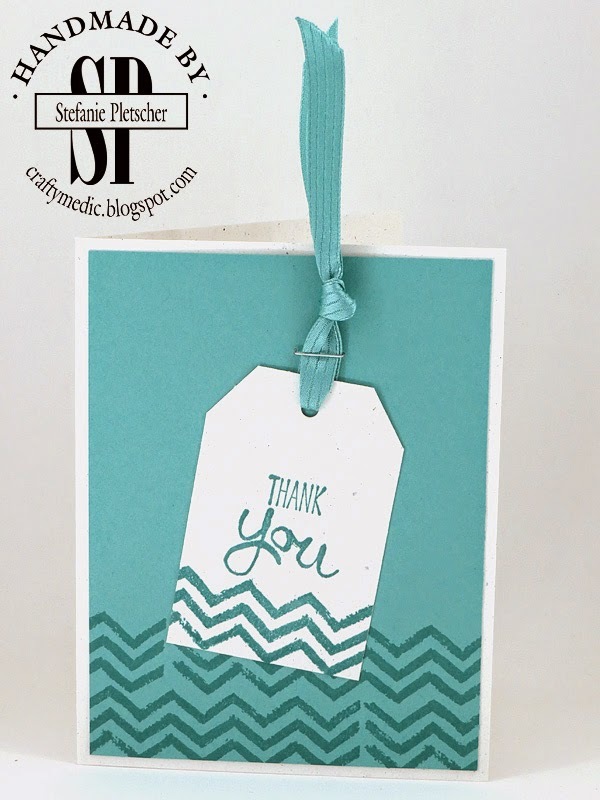 I love this easy trick to step up a card just that extra bit. 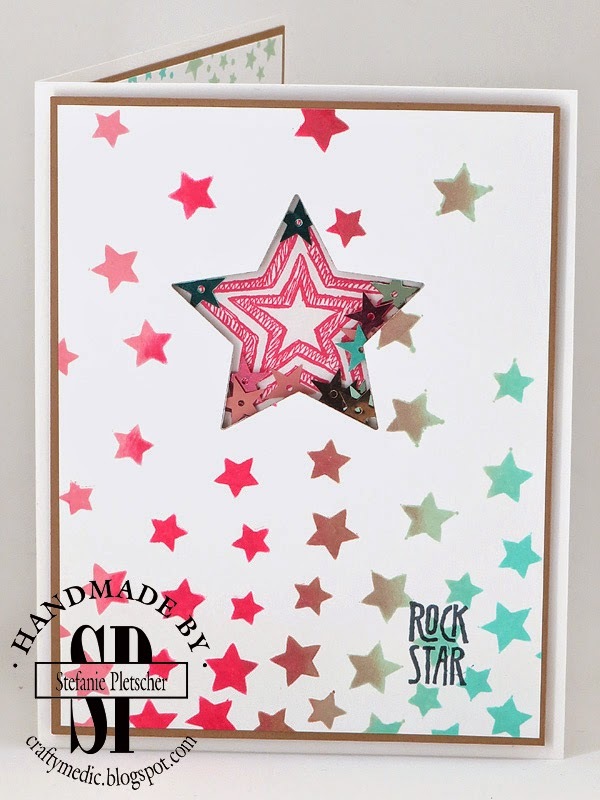 Don't forget to check out everyone else's project over on the Watercooler Challenge Blog and that any of the current supplies used here can be purchased online!